(Vatican Radio) October 31st 2017 marks the 500th anniversary of the day on which German theologian Martin Luther published his 95 theses, setting in motion the events of the Protestant Reformation. To mark the occasion, the Pontifical Council for Promoting Christian Unity and the Lutheran World Federation on Tuesday issued a joint statement, giving thanks for the spiritual and theological gifts received through the Reformation and recalling the commemorative events that have taken place over the past year. Exactly one year ago, Pope Francis travelled to the Swedish cities of Lund and Malmo to take part in a joint commemoration of the Reformation alongside leaders of the Lutheran World Federation. A moving liturgy in the ancient Lund cathedral and a joyful celebration of young people in Malmo arena focused on asking forgiveness for the sins of past centuries, while also celebrating the progress of the last fifty years and pledging to step up joint efforts in the service of those most in need. One year on, today’s statement recalls those historic events, in particular the commitment by Pope Francis and former LWF president Bishop Munib Younan to continue the ecumenical journey. The statement says the shared journey of the past fifty years has resulted in “the removal of prejudices, the increase of mutual understanding and the identification of decisive theological agreements”. While Catholics and Lutherans can still not share at the Eucharistic table, the two Churches acknowledge their “joint pastoral responsibility to respond to the spiritual thirst and hunger of our people to be one in Christ “. Commemorating the Reformation together in many countries around the world, the statement says, has allowed Lutherans and Catholics new insights into events of the 16th century which led to their separation. Noting the theological progress that was made through the Joint Declaration on the Doctrine of Justification, the statement says growing communion and shared service are a sign of hope for the world of today to overcome divisions and fragmentation. The statement concludes with a commitment to continue the journey towards unity, guided by God’s Spirit, in the knowledge that “what we have in common is far more than that which still divides us”. We, Lutherans and Catholics, are profoundly grateful for the ecumenical journey that we have travelled together during the last fifty years. This pilgrimage, sustained by our common prayer, worship and ecumenical dialogue, has resulted in the removal of prejudices, the increase of mutual understanding and the identification of decisive theological agreements. In the face of so many blessings along the way, we raise our hearts in praise of the Triune God for the mercy we receive. On this day we look back on a year of remarkable ecumenical events, beginning on 31st October 2016 with the joint Lutheran - Catholic common prayer in Lund, Sweden, in the presence of our ecumenical partners. While leading that service, Pope Francis and Bishop Munib A. Younan, then President of the Lutheran World Federation, signed a joint statement with the commitment to continue the ecumenical journey together towards the unity that Christ prayed for (cf. John 17:21). On the same day, our joint service to those in need of our help and solidarity has also been strengthened by a letter of intent between Caritas Internationalis and the Lutheran World Federation World Service. 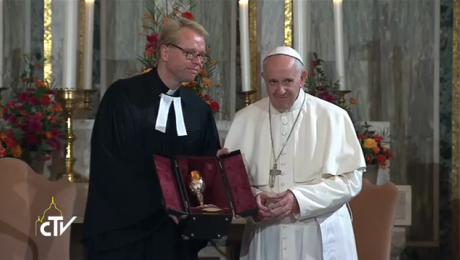 We rejoice that the Joint Declaration on the Doctrine of Justification, solemnly signed by the Lutheran World Federation and the Roman Catholic Church in 1999, has also been signed by the World Methodist Council in 2006 and, during this Commemoration Year of the Reformation, by the World Communion of Reformed Churches. On this very day it is being welcomed and received by the Anglican Communion at a solemn ceremony in Westminster Abbey. On this basis our Christian communions can build an ever closer bond of spiritual consensus and common witness in the service of the Gospel. Looking forward, we commit ourselves to continue our journey together, guided by God's Spirit, towards the greater unity according to the will of our Lord Jesus Christ. With God’s help we intend to discern in a prayerful manner our understanding on Church, Eucharist and Ministry, seeking a substantial consensus so as to overcome remaining differences between us. With deep joy and gratitude we trust “that He who has begun a good work in [us] will complete it until the day of Jesus Christ” (Phil 1:6).